... for the earth shall be full of the knowledge of the LORD, as the waters cover the sea. (Isaiah 11:9). And Jesus looking upon them saith ... with God all things are possible (Matthew 19:26). And it shall come to pass in the last days, that the mountain of the LORD's house shall be established in the top of the mountains, and shall be exalted above the hills; and all nations shall flow unto it. And many people shall go and say, Come ye, and let us go up to the mountain of the LORD, to the house of the God of Jacob; and he will teach us of his ways, and we will walk in his paths: for out of Zion shall go forth the law, and the word of the LORD from Jerusalem. And he shall judge among the nations, and shall rebuke many people: and they shall beat their swords into plowshares, and their spears into pruninghooks: nation shall not lift up sword against nation, neither shall they learn war any more (Isa. 2:2-4). Still Waters Revival Books (SWRB) has been publishing and distributing, free and at great discounts, classic and contemporary Christian (Puritan, Reformation, Presbyterian, Reformed, Baptist, Covenanter, Calvinistic, etc.) books, audio (more recently MP3s), and videos, worldwide, for over 25 years. Most of the ministry of Still Waters Revival Books consists of giving Puritan, Covenanter and Reformation resources away for free through various Web sites we operate, missionaries we assist (especially missionaries working in lands hostile to the Gospel), etc. By God's marvelous grace we are already able to reach millions each month with some type of free Gospel related message and, as the Lord enables, we plan on greatly expanding the amount of Reformation related resources we give away for free (Matthew 10:8). You may email us at free-Reformation-resources@puritandownloads.com for more information on this aspect of our ministry and for the location of some of our other Web sites where more free material is available. 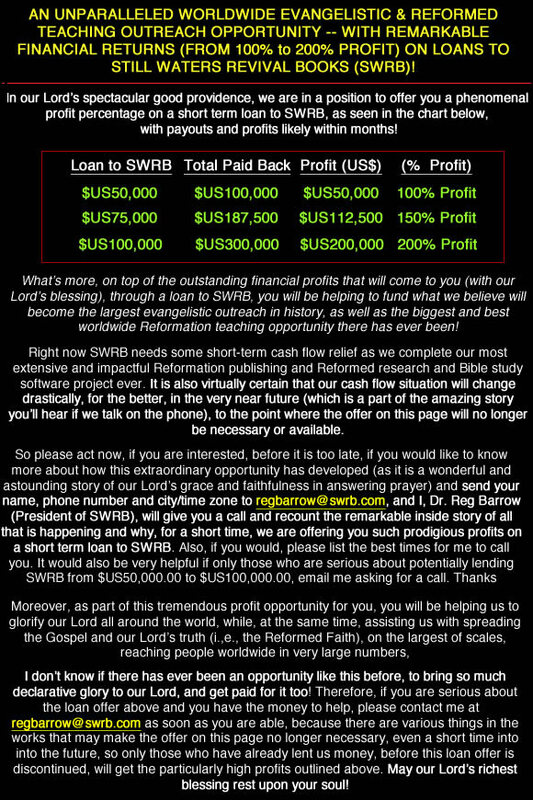 If you join our email list (use the "Our Newsletter" form on this page/site or email us at add@puritandownloads.com) you will be regularly alerted to the location(s) of new free SWRB Reformation resources and our best "Super Sales." We also accept donations to further this work of Reformation, though we are not able to give tax deductible receipts. However, we can guarantee that the Lord will know of your gift (after all, He ordained it, Eph. 1:11), and graciously and eternally reward you for every penny of good that comes from your donation (Matthew 10:42) - if it is given by faith in the Lord Jesus Christ and to uplift His holy name (Hebrews 11:6). Funds from purchases you make at this Web site (PuritanDownloads.com) also go to further the spread of the Gospel of God's sovereign grace, in many nations, through the distribution of free resources, as well as to support those involved in this ministry. In short, one of our main goals is to produce and freely distribute as many "no cost" Christian (Reformation and Puritan) resources as we can. With your help, through prayer, donations and purchases (from this Web site) you will be helping us to glorify God through the worldwide publication and distribution of the best possible Reformation resources. Recently we've added the Puritan Hard Drive (the most advanced Christian search and research study tool ever, by God's grace, created) and a wide array of inexpensive digital downloads to our publications and offerings. As we are enabled by the Lord to publish more new (SWRB published) digital downloads (we have targeted thousands more classic Puritan and Reformed books for digitization), they will be added to this Web site (PuritanDownloads.com) and also integrated with the embedded database and the custom KnowledgeBase software on the Puritan Hard Drive - so the Puritan Hard Drive can grow with you as you grow in grace (2 Peter 3:18). Lord willing, in the future, we will also be able to work with more and more Reformed, creationist and homeschooling publishers, to add their books (and audio and video resources) to our digital download offerings and integrate them with the Puritan Hard Drive. We would love to create for you a central online location for all your Reformation, creationist and homeschooling resource needs, along with the world's most powerful platform, in the Puritan Hard Drive, to enhance your knowledge of the Lord (2 Timothy 2:15, Proverbs 4:7) and expeditiously further your sanctification (Ephesians 5:16). At SWRB we also have a Puritan Hard Drive missionary and ministry donation program, where for every Puritan Hard Drive donated (i.e. full payment purchase designated for a mission, missionary, pastor, elder, seminary student, poor or persecuted Christian, seminary library or church library), we match your donation with another Puritan Hard Drive which will be donated free of charge (by SWRB) to a mission, missionary, pastor, elder, seminary student, poor or persecuted Christian , seminary library or church library in need. "Man's chief end is to glorify God, and to enjoy him forever." The truth of this classic Covenanter/Puritan statement from the Westminster Shorter Catechism (Answer #1) is demonstrated throughout the Bible (cf. Psalm 86, Isaiah 60:21, Romans 11:36, 1 Corinthians 6:20 and 10:31. Revelation 4:11, Psalm 16:5-11, Psalm 144:15, Isaiah 12:2, Luke 2:10, Philippians 4:4, Revelation 21:3-4). It has always been our primary goal at SWRB to glorify God. We think this can best be accomplished, given our calling and providential position in a global Puritan publishing ministry, by making the very best Christian resources (from all ages of Christian history) available for free or at the lowest prices possible - to the whole world. The Lord Jesus Christ commanded us to love God with all our heart, soul, strength and mind (Luke 10:27) and too often in our day the commandment to love God with all our mind is forgotten or ignored - as if ignorance of faithful biblical doctrine was some kind of a blessing. By publishing the best books of the best Puritans, Reformers and Covenanters, men who excelled at loving God with all their hearts and minds (following the Savior even to martyrdom when called thereunto), and making these books (MP3s, videos, etc.) easily accessible, we hope and pray to bring much declarative glory to our Lord. Furthermore, at SWRB, we strive to use as much of the proceeds from sales, as is possible, to produce more free and discounted Reformation resources. This is how, by God's grace, we have published so many books, MP3s and videos over the years (with a relatively small staff and the help of volunteers) and why we are able to distribute so much material for free and at such low prices - may our Lord get all the glory! With your continued prayers, support and purchases we will be able to reach even more people, in the future, all around the world with the truth of the Scriptures - using the latest and best technologies available, in the service of the Lord, to greatly multiply all the good that can be done, and aiming to fill the world with the best Christian resources available (Acts 17:6). The Scripture is clear that a time is coming when "the earth shall be full of the knowledge of the LORD, as the waters cover the sea" (Isaiah 11:9) and that "it shall come to pass in the last days, that the mountain of the LORD's house shall be established in the top of the mountains, and shall be exalted above the hills; and all nations shall flow unto it" (Isaiah 2:2, and remember there are no nations in heaven!). If the classic Reformation position on eschatology (Historicism) is biblical, and we believe it is, these glorious days may be closer than many people think. Nevertheless, whether the beginning of the Holy Spirit's preparation of the Earth for the halcyon days of the prophesied magnificent millennium to come is years or decades away, one thing is certain: God has begun to bring about a third great Reformation in our day - as classic Calvinist thought, practice and publishing is once again beginning to spread around the globe and be embraced, by God's sovereign grace of, in ever increasing numbers. In fact, it wouldn't surprise me if there are more people alive today, than at any other point in history, who know, understand and believe in the biblical doctrine of the absolute sovereignty of God as it is revealed in Scripture (what is sometimes nicknamed "Calvinism"). Moreover, we know from the Bible that "all kings shall fall down before him: all nations shall serve him" (Psalm 72:11, and this must be pointing to a time in the future, as there is only one King in heaven and there are no nations in heaven, and this verse has never been fulfilled at any prior time in history). Additionally, Scripture is clear that Christ's kingdom is "the stone that smote the image (and) became a great mountain, and filled the whole earth" (Dan. 2:35, also see Ezek. 47:1-12). Thus, we know with the certainty that comes from the inspired Word of God that the greatest historic Reformation and revival of biblical Christianity that will ever take place is yet future. It is even possible we may even be in the early phase of this great Reformation and revival right now. These Bible verses also tell us that the days are coming when biblical Calvinism, by God's sovereign grace, will rule the nations of this world - much like what we saw in the small foretaste of this in the Second Reformation, when whole nations (as nations) Calvinistically covenanted to serve the Lord, according to what He has revealed in the Bible, in the Solemn League and Covenant (which led to the production of the Westminster Standards - the most faithful summary of the teaching of Bible ever produced)! "All that learning the most profound and extensive, intellect the most acute and searching, and piety the most sincere and earnest,could accomplish, was thus concentrated in the Westminster Assembly's Confession of Faith, which may be safely termed the most perfect statement of Systematic Theology ever framed by the Christian Church." "No man who is able to understand its nature, and to feel and appreciate its spirit and its aim, will deny it to be the wisest, the sublimest, and the most sacred document ever framed by uninspired men (The History of the Westminster Assembly of Divines, 1856, SWRB reprint 1993, p. 134, as cited in Dr. Reg Barrow's Saul in the Cave of Adullam, A Contemporary Reformation Debate with Doug Wilson - all books noted above are available on SWRB's Puritan Hard Drive)." You can play a part in theinternational third Reformation of our day by regularly praying for SWRB, by volunteering to read for SWRB so we can give away more free Reformed MP3s (contact us at read-Reformation-MP3s@puritandownloads.com for reading instructions), by designating donations or purchasing from this Web site to help us help Reformed missionaries deliver the best Reformation books, MP3s and videos to poor and persecuted Christians in Muslim, Communist and other lands, and to help us produce and deliver more great Christian books, MP3s, videos (and other Reformation resources), worldwide, free of charge and at the largest discounts possible. The Lord gave the word: great was the company of those that published it (Psalm 68:11). Join with us today, in any of the ways outlined above, in making the glory of God known to the nations! And Jesus said unto them... verily I say unto you, If ye have faith as a grain of mustard seed, ye shall say unto this mountain, Remove hence to yonder place; and it shall remove; and nothing shall be impossible unto you (Matthew 17:20). "Now, Christians, the more great and glorious things you expect from God, as the downfall of antichrist, the conversion of the Jews, the conquest of the nations to Christ, the breaking of all yokes, the new Jerusalem's coming down from above, the extraordinary pouring out of the Spirit, and a more general union among all saints, the more holy, yea, the more eminently holy in all your ways and actings it becomes you to be" (Thomas Brooks, The Crown and Glory of Christianity, 1662, Complete Works, 1867, p. 444 - and available on SWRB's Puritan Hard Drive. Cited here from Iain Murray's important book, The Puritan Hope: Revival and the Interpretation of Prophecy, p. 84).